To alleviate the pain due to percutaneous nephrolithotomy (PCNL) surgery and nephrostomy tube, high-dose analgesics are required, but the use of analgesics in patients with decreased renal function has certain challenges. Skin infiltration around the incision, thoracic paravertebral block, can be used for postoperative pain relief. Some studies have shown that the infiltration of local anesthetic along the nephrostomy tube tract from the skin up to renal capsule in patient undergoing conventional PCNL is effective. Additives are commonly used with local anesthetics for its synergistic effect. In this study, we aimed to compare the analgesic efficacy of fentanyl and dexmedetomidine to ropivacaine in peritubal infiltration. This prospective randomized comparative study was performed in a tertiary care center. Institutional Ethical Committee clearance was obtained before and registered in CTRI with registration number CTRI/2018/06/014619. Informed consent was obtained in written from the patients. The study included a total of 60 American Society of Anesthesiologists (ASA) Class I, II, and III patients who were scheduled for percutaneous nephrolithotomy. Exclusion criteria included patients requiring supracostal puncture or more than one puncture or patients having excessive intraoperative bleeding and stone size >3 cm. Patients were enrolled sequentially and randomized by computer-generated block size. Each block had three patients. They were divided in two equal groups randomly, Group ropivacaine and fentanyl (RF) or fentanyl group (0.2% ropivacaine with 0.5 μg/kg fentanyl) and Group ropivacaine and dexmedetomidine (RD) or dexmedetomidine group (0.2% ropivacaine with 0.5 μg/kg dexmedetomidine), of 30 patients each. Preoperatively, detailed history was obtained and routine investigations were done. The procedure was performed under general anesthesia assisted with mechanical ventilation. Anesthesia was induced with 2 μg/kg fentanyl, 1% propofol in titrated dose, and 0.5 mg/kg atracurium. An appropriate-sized cuffed endotracheal tube was used for tracheal intubation. Standard ASA monitoring included electrocardiogram, pulse oximetry, capnography, and core temperature. Anesthesia was maintained with isoflurane (0.4%–0.8%) in N2O and O2 mixture, and intermittent atracurium boluses were administered according to train-of-four responses. Fentanyl 1 μg/kg will be administered if required based on hemodynamic parameters. After the completion of procedure, a routine nephrostogram was performed, and the nephrostomy tube was clamped. Retained contrast in the tube helped to guide the needle during peritubal infiltration. 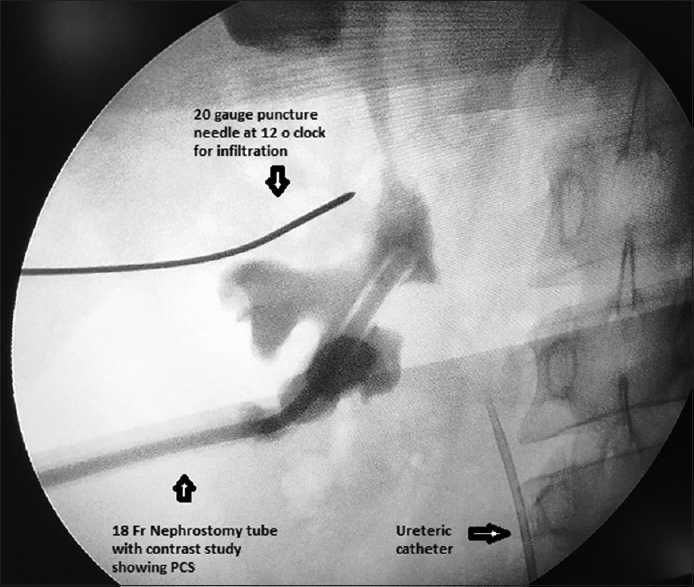 A 20G spinal needle was introduced under fluoroscopic guidance at 12 O'clock position to the nephrostomy tube up to the renal capsule [Figure 1]. The study drug was then injected along the tissue planes while withdrawing the needle slowly. Similarly, the drug was infiltrated at 6 O'clock position [Figure 2]. At each site, 10 ml of 0.2% ropivacaine along with 0.5 μg/kg fentanyl in group RF and 10 ml of 0.2% ropivacaine along with 0.5 μg/kg dexmedetomidine in group RD were infiltrated along renal capsule, muscle, subcutaneous tissue, and skin maintaining aseptic conditions. The patients were shifted to the postanesthesia care unit for further care after extubation. Postoperatively, visual analog scale (VAS) (0–10) was used for assessment of pain at rest and dynamic VAS (DVAS) (0–10) was used during coughing and deep breathing, by an independent observer who was blinded to the study drug infiltrated. VAS is presented as a 10-cm horizontal line that represents as a continuum between the two ends of scale with the left end (0 cm) as “no pain” and the right end (10 cm) as “worst imaginable pain.” Patients were asked to mark a point on the line that best represented their pain. VAS numerical value was measured as the distance in cm. From the starting point (0 cm) to the patient's mark, pain was checked out at 0 h, every hour for the next 2 h, every 2 h for the next 4 h, and every 6 h till 48 h. Intravenous tramadol 1 mg/kg was given when VAS or DVAS was ≥4, as a rescue analgesic up to 48 h. The total dose of tramadol was restricted to 400 mg in 48 h. Peritubal block duration was considered as the time from infiltration to the first demand for rescue analgesic. The total requirement of tramadol within 48 h and any side effects such as nausea, vomiting, and sedation was observed. Sedation score (1–5) was used for assessment of sedation (from 1 – completely awake to 5 – asleep and not responsive to any stimulus). Statistical analysis was performed using SPSS version 18.0.CHICAGO: SPSS Inc. for Windows program. Descriptive data were expressed in mean and standard deviation for between-group comparisons; the Chi-square and Fisher's exact tests were used for categorical variables, whereas t-test and Mann–Whitney U-test were used to compare continuous variables between the two groups. P < 0.05 was considered statistically significant. Required sample size for each study group was estimated with the help of OpenEpi software (version 3) based on a similar study by Parikh et al., where mean duration of analgesia of 13.7 h (95% confidence interval [CI]: 12.4–15.02) for one group and 10.7 h (95% CI: 9.72–11.78) for another group. It was estimated as minimum sample size of 23 each, at 0.05 significance level with 90% power. Thirty patients were recruited in each group in our study. Sixty-eight patients were enrolled in the study. Eight patients were excluded due to not fulfilling inclusion criteria. A total of 60 patients scheduled for PCNL were randomized. There were no dropouts [Figure 3]. Basic details were comparable in both the groups [Table 1]. VAS and DVAS were significantly high in fentanyl group in first 24 h with the exclusion at 0 min and 18 h postoperatively. 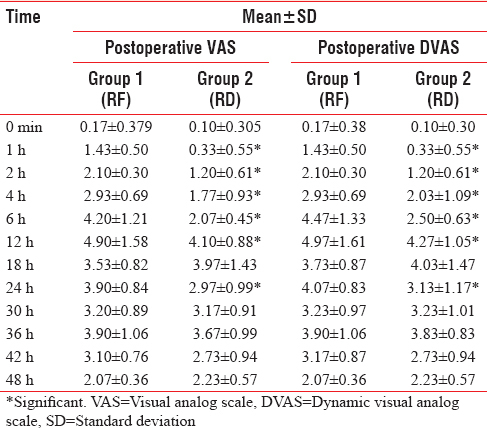 Furthermore, VAS and DVAS were comparable in the next 24 h postoperatively [Table 2] and [Figure 4],[Figure 5]. Total number of dose of rescue analgesia in 48 h was significantly higher in fentanyl group (4.30 ± 0.70) as compared to dexmedetomidine (3.20 ± 0.61). 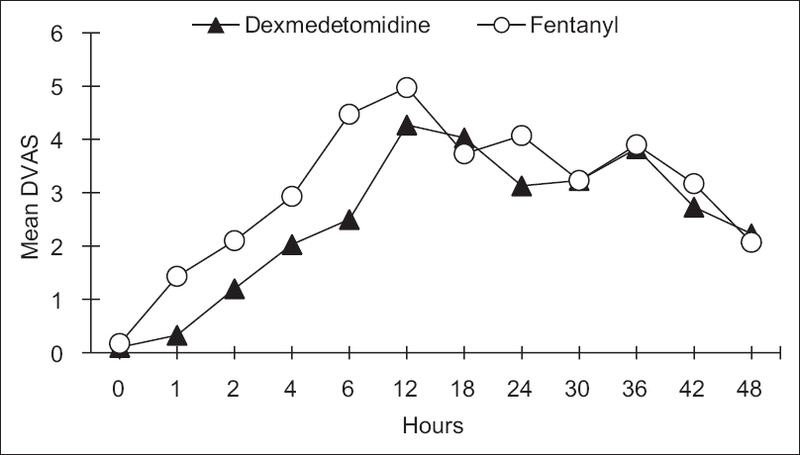 Total number of dose of rescue analgesia in the first 24 h was significantly higher in fentanyl group (2.90 ± 0.61) as compared to dexmedetomidine (1.73 ± 0.69), whereas total dose of rescue analgesia in the next 24 h was comparable in both the groups. 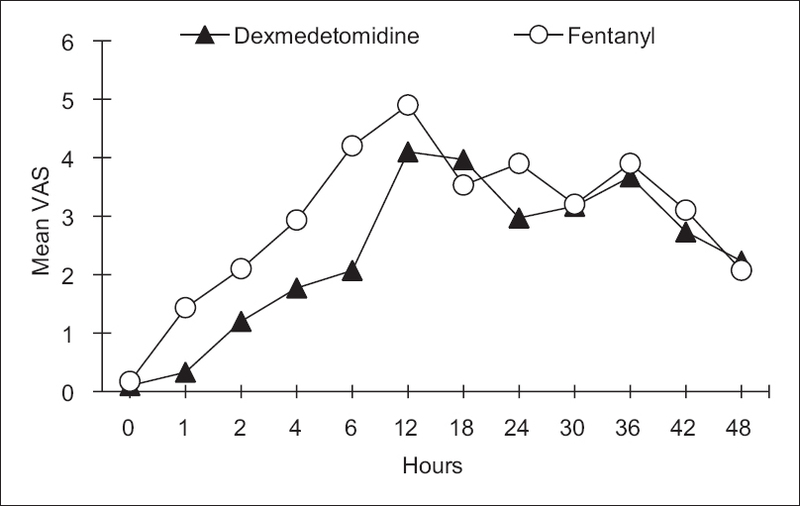 Time of requirement of the first rescue analgesic was 8.13 ± 3.28 h in fentanyl group, whereas it was 12.87 ± 3.85 h in dexmedetomidine group, which was significantly longer in dexmedetomidine group [Table 3]. 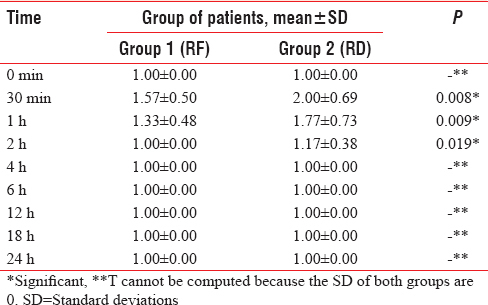 Sedation was significantly higher in the group RD in the first 2 h postoperative [Table 4], with maximum sedation score of 3. There was no incidence of bradycardia or hypotension found in dexmedetomidine group [Figure 6]. Nephrostomy tube is generally placed after the completion of PCNL to provide adequate drainage, hemostasis, and as access for second-look procedure. Various studies are done aiming to decrease the pain and discomfort due to nephrostomy tube. Furthermore, tubeless PCNL has been advocated by some authors, decreasing pain, and analgesic requirement. However, there are some limitations for tubeless PCNL, such as perforation, excess bleeding, or complex stones. A further alternative to lessen postoperative pain is to reduce the size of the nephrostomy tube. 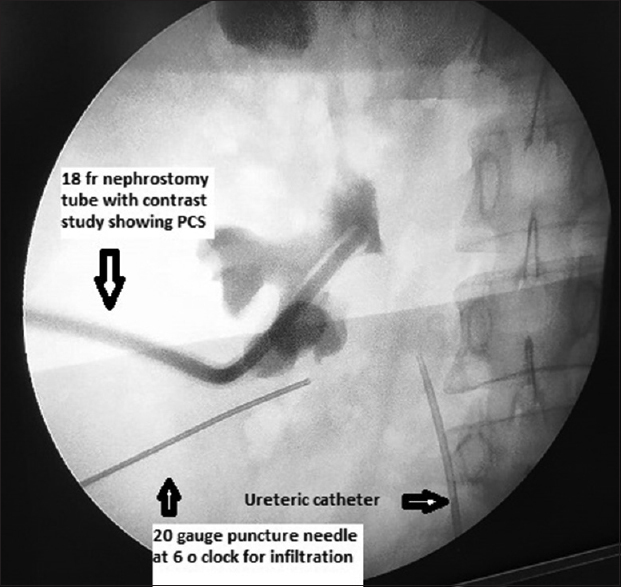 Small size (8–12 Fr) nephrostomy tube has been used in patients with uneventful PCNL or in those patients in whom percutaneous access may be required for succeeding calculus manipulation. While for procedures with significant bleeding, prolong duration, large complex or infected calculi, or major perforations, conventional nephrostomy tube with large bore may be required. The pain and discomfort after PCNL may be caused by local inflammatory reaction produced by nephrostomy tube. Local anesthetics can inhibit inflammatory response by suppressing some phases of inflammation and local sensitizing response by blocking inflammation-induced neuronal pathways. It is demonstrated by Jonnavithula et al., where bupivacaine infiltration was given beside the nephrostomy tube under fluoroscope, resulting in prolonged duration of analgesia and lower pain scores in bupivacaine group compared to the control group. In our study, we used 0.2% ropivacaine because of its better pharmacokinetic profile than bupivacaine. Kaushal-Deep et al. used 0.2% ropivacaine as intraincisional infiltration and intraperitoneal instillation in postlaproscopic cholecystectomy. It showed that low concentration (0.2%) provides adequate postoperative analgesia and emphasized that large amount of drug is unjustified. In this study, we aimed to assess analgesic efficacy of dexmedetomidine and fentanyl when added to ropivacaine in peritubal infiltration. There is no such study in literature comparing the analgesic efficacy of dexmedetomidine and fentanyl in peritubal infiltration. In a study by Parikh et al., it was concluded that the use of morphine as additive to local anesthetic for peritubal infiltration extended the analgesic duration significantly, and the time of requirement of the first rescue analgesics is also significantly prolonged. In our study, we used fentanyl instead of morphine due to its less histamine-releasing property. Fentanyl has been used as an adjunct to local anesthetics during regional or peripheral nerve blocks and has resulted in prolongation of analgesic duration. Mechanism of fentanyl in prolongation of analgesia may be due to the existence of peripheral functional opioid receptors, but this existence in peripheral tissue is still doubtful. A less likely mechanism of action is local anesthetic action of fentanyl. Local anesthetic properties of opioids have been discussed in earlier studies. Murugan et al. used dexmedetomidine along with ropivacaine as nephrostomy tract block in tubeless PCNL. 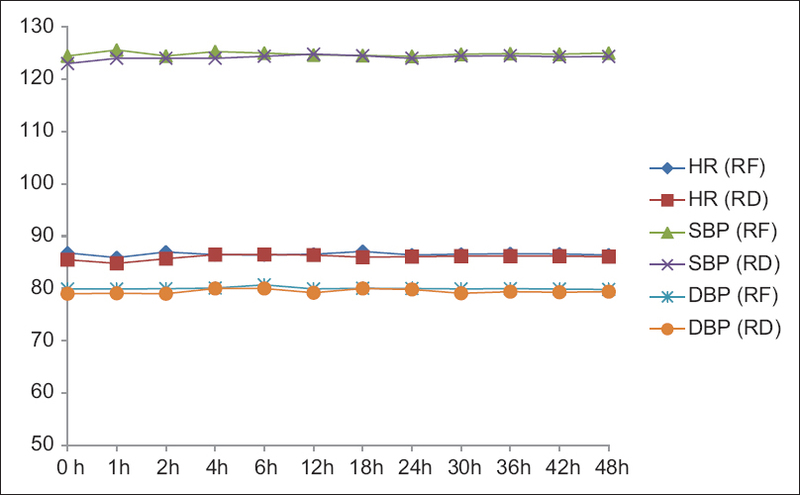 The total analgesic requirement was significantly lower than the control group, whereas the first analgesic dose time was prolonged (10 h). Major limitation of the study was that it used placebo as control group. Murphy et al. and Brummett et al. reported in their studies on administration of dexmedetomidine as an adjuvant that the mechanism of analgesic properties of dexmedetomidine is still not clear and may be multifactorial. Possible mechanisms explained by Lee et al. showed that dexmedetomidine induces vasoconstriction through an action on α2 receptors, or it produces analgesia peripherally by reducing norepinephrine release and increasing the potassium conduction in C- and A-delta neurons responsible for passage of pain stimulus, whereas it produces sedation and analgesia centrally by acting on locus coeruleus and dorsal root ganglia thereby inhibiting the release of substancePin nociceptive pathway. The analgesic supplementary effects of dexmedetomidine in this study confirm the conclusion of other investigators. The present study also confirms the better analgesic-sparing effect of dexmedetomidine than fentanyl as demonstrated in the previous studies when used as an adjuvant to bupivacaine in supraclavicular nerve block and wound infiltration in abdominal hysterectomy. On the other hand, we observed mild sedation in both the groups with maximum sedation score of 3 in RD group which was short lived. This was in fact well tolerated. There was no difference between the groups in terms of nausea or postoperative bleeding episode. Major limitation of this study is its being single-centered design. Peritubal block is simple, easy to perform, and effective method for postoperative analgesia in PCNL procedures. Addition of dexmedetomidine to local anesthetic ropivacaine for peritubal block significantly prolonged the duration of postoperative analgesia as compared to fentanyl. Furthermore, total consumption of rescue analgesia is significantly less in initial 24 h when dexmedetomidine is used as additive as compared to fentanyl in peritubal block in PCNL surgery. Tawfic QA, Bellingham G. Postoperative pain management in patients with chronic kidney disease. J Anaesthesiol Clin Pharmacol 2015;31:6-13. Ak K, Gursoy S, Duger C, Isbir AC, Kaygusuz K, Ozdemir Kol I, et al. Thoracic paravertebral block for postoperative pain management in percutaneous nephrolithotomy patients: A randomized controlled clinical trial. Med Princ Pract 2013;22:229-33. Kirac M, Tepeler A, Bozkurt OF, Elbir F, Ozluk C, Armagan A, et al. 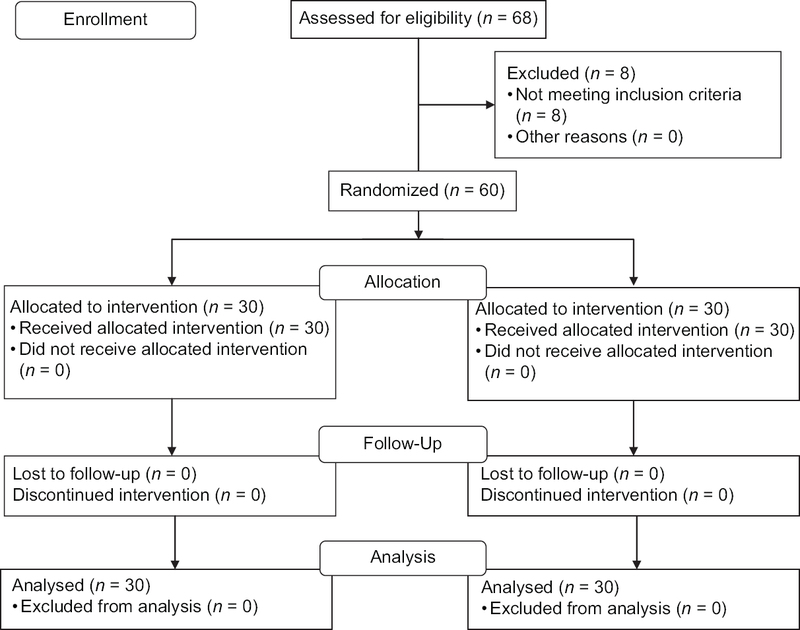 The efficacy of bupivacaine infiltration on the nephrostomy tract in tubeless and standard percutaneous nephrolithotomy: A prospective, randomized, multicenter study. Urology 2013;82:526-31. Swain A, Nag DS, Sahu S, Samaddar DP. Adjuvants to local anesthetics: Current understanding and future trends. World J Clin Cases 2017;5:307-23. Delgado DA, Lambert BS, Boutris N, McCulloch PC, Robbins AB, Moreno MR, et al. Validation of digital visual analog scale pain scoring with a traditional paper-based visual analog scale in adults. J Am Acad Orthop Surg Glob Res Rev 2018;2:e088. Parikh GP, Shah VR, Vora KS, Parikh BK, Modi MP, Kumari P, et al. Ultrasound guided peritubal infiltration of 0.25% bupivacaine versus 0.25% ropivacaine for postoperative pain relief after percutaneous nephrolithotomy: A prospective double blind randomized study. Indian J Anaesth 2014;58:293-7. Candela J, Davidoff R, Gerspach J, Bellman GC. “Tubeless” percutaneous surgery: A new advance in the technique of percutaneous renal surgery. Tech Urol 1997;3:6-11. Strichartz GR. Novel ideas of local anaesthetic actions on various ion channels to ameliorate postoperative pain. Br J Anaesth 2008;101:45-7. Jonnavithula N, Pisapati MV, Durga P, Krishnamurthy V, Chilumu R, Reddy B, et al. Efficacy of peritubal local anesthetic infiltration in alleviating postoperative pain in percutaneous nephrolithotomy. J Endourol 2009;23:857-60. Kaushal-Deep SM, Anees A, Khan S, Khan MA, Lodhi M. Randomized controlled study of intraincisional infiltration versus intraperitoneal instillation of standardized dose of ropivacaine 0.2% in post-laparoscopic cholecystectomy pain: Do we really need high doses of local anesthetics-time to rethink! Surg Endosc 2018;32:3321-41. Parikh GP, Shah VR, Vora KS, Modi MP, Mehta T, Sonde S, et al. Analgesic efficacy of peritubal infiltration of ropivacaine versus ropivacaine and morphine in percutaneous nephrolithotomy under ultrasonic guidance. Saudi J Anaesth 2013;7:118-21. Chavan SG, Koshire AR, Panbude P. Effect of addition of fentanyl to local anesthetic in brachial plexus block on duration of analgesia. Anesth Essays Res 2011;5:39-42. Kaniyil S, Radhakrishnan P. Does fentanyl prolong the analgesia of local anesthetics in brachial plexus block? A randomized controlled study. Int J Res Med Sci 2017;5:583-7. Tejwant R, Das N, Parua S, Kundu R. Fentanyl as an adjuvant for brachial plexus block: A randomized comparative study. Int J Clin Trials 2016;3:64-7. Murugan P, Arumugam BI, Murugesan A, Alagesan SK. Nephrostomy tract block with ropivacaine and dexmedotamide decreases analgesia requirement in renal failure patients undergoing tubeless percutaneous nephrolithotomy – A prospective double blind randomized control study. Indian J Basic Applied Med Res 2016;5:828-35. Murphy DB, McCartney CJ, Chan VW. Novel analgesic adjuncts for brachial plexus block: A systematic review. Anesth Analg 2000;90:1122-8. Lee MJ, Koo DJ, Choi YS, Lee KC, Kim HY. Dexamethasone or dexmedetomidine as local anesthetic adjuvants for ultrasound-guided axillary brachial plexus blocks with nerve stimulation. Korean J Pain 2016;29:29-33. Hamed MA, Ghaber S, Reda A. Dexmedetomidine and fentanyl as an adjunct to bupivacaine 0.5% in supraclavicular nerve block: A randomized controlled study. Anesth Essays Res 2018;12:475-9. Kadyan N, Khatri ML. Comparison of dexmedetomidine and fentanyl as adjuvant for wound infiltration to bupivacaine for postoperative pain relief after abdominal hysterectomy. IOSR J Dent Med Sci 2017;16:11-4.